Arch Linux (or Arch, pronounced /ˈɑrtʃ/) is an independently developed, Linux-based operating system for i686 and x86-64 computers. It is composed predominantly of free and open source software, and supports community involvement. Arch Linux uses a rolling release model, such that a regular system update is all that is needed to obtain the latest Arch software; the installation images released by the Arch team are simply up to date snapshots of the main system components. To facilitate regular package changes, pacman was developed by Judd Vinet to provide Arch with its own package manager able to track dependencies. The Arch focus on simplicity and economy for developers means, among other things, that the main effort in assisting the user is not expended in crafting GUI configuration tools — the package manager, for example, does not have an official graphical front-end — but making well-annotated configuration files and extensive use of shell scripts. This has earned it a reputation as a distribution for "intermediate and advanced Linux users who aren't afraid of the command line". Arch uses a BSD-style init framework, a tradeoff of flexibility for simplicity. It also includes and permits use of System V runlevels and the inittab file, but there is little differentiation between runlevels. This is because the modules and daemons loaded at startup are arranged as arrays in the central configuration file, /etc/rc.conf, as opposed to System V's system of a directory for each runlevel containing a numbered symbolic link for each daemon. There is also the ability to start processes asynchronously, which neither the original BSD init nor the original Sys V init have. See init for more detail on the differences between the two systems. The Arch Linux website supplies ISO images that can be run from CD or USB. The Arch Linux installer is a shell script using dialog for user interaction. The default install is minimalistic. Further system customization and expansion (adding a window manager, desktop environment, etc.) must be done manually, installing packages downloaded from online repositories. Arch is therefore generally considered relatively involved to install, in comparison to other operating systems. An alternative to using CD or USB images for installation is to use the static version of the package manager Pacman, from within another GNU/Linux based operating system. The user can mount his or her newly formatted drive partition, and use Pacman with the appropriate command-line switch to have it use the mountpoint of the device as root for its operations. This way the base package group and any additional packages can be installed on the newly formatted partition by having Pacman retrieve them from its mirrors. However, there are further actions that need to be taken before the system is ready for use after this process, most notably installing a bootloader, and making various configurations to the new system. All packages are managed using the Pacman package manager. Pacman handles package installation, upgrades, removal and downgrades, and features automatic dependency resolution. The packages for Arch Linux are obtained from the Arch Linux package tree and are compiled for either i686 or x86-64 architectures. 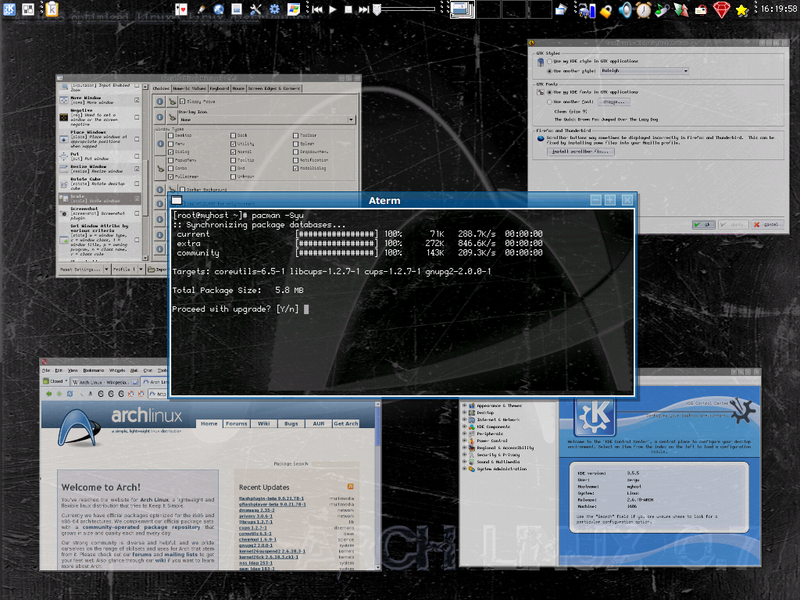 Arch Linux is primarily based on binary packages in the tar.gz and tar.xz format. multilib, a centralized repository for x86_64 users to more readily support 32-bit applications in a 64-bit environment. The unstable repository was dropped in July 2008 and most of the packages moved to other repositories. In addition to the official repositories, there are a number of unofficial user repositories, the most well-known being the Arch User Repository, or AUR, hosted on the Arch Linux site. Until version 4.0.0 Arch Linux's package manager lacked support for signed packages. As of 6 November 2011, 51% of packages in the repositories are signed.. Packages and metadata were not verified for authenticity by pacman during the download-install process. Without package authentication checking, tampered-with or malicious repository mirrors could have compromised the integrity of a system. The Arch Build System is a ports-like source packaging system that compiles source tarballs into binary packages, which are installed via Pacman. The Arch Build System provides a directory tree of shell scripts, called PKGBUILDs, that enable any and all official Arch packages to be customized and compiled. Rebuilding the entire system using modified compiler flags is also supported by the Arch Build System. The Arch Build System makepkg tool can be used to create custom .pkg.tar.xz packages from third-party sources. The resulting packages are also installable and trackable via Pacman. In addition to the repositories, the Arch User Repository provides user-made PKGBUILD scripts for packages not included in the repositories. The PKGBUILD scripts simplify building from source by explicitly listing and checking for dependencies and configuring the install to match the Arch architecture. The scripts are available for download from http://aur.archlinux.org. Arch User Repository helper programs can further streamline the downloading and building process. However, such tools that search, download and run PKGBUILD scripts automatically will never be included in the official repositories because of potential security risks. License issues. Software that cannot be redistributed, but is free to use, can be included in the Arch User Repository since all that is hosted by the Arch Linux web site is a shell script that downloads the actual software from elsewhere. Examples include proprietary freeware such as Google Earth and RealPlayer. Modified official packages. The Arch User Repository also contains many variations on the official packaging as well as beta versions of software that is contained within the repositories as stable releases. Rarity of the software. Some new or rarely used programs have not been added to the official repositories (yet). Similar to Gentoo, and unlike other major distributions such as Ubuntu and Fedora, Arch Linux does not schedule releases for specific dates but uses a "rolling release" system, with new packages provided daily. Its package management allows users to keep systems up-to-date easily. Rather than encouraging users to move between discrete releases, Arch Linux releases are simply snapshots of the current set of packages, sometimes with revised installation software. Therefore it makes no difference from which release Arch gets installed if updates are installed afterwards. In fact, some members of the Arch forums take pride in showing the age of the installation. From version 2009.02 the goal is to bring coordinated releases following the rhythm of kernel releases, in order to provide optimal hardware support, this means a new release every 3 or 4 months. As of August 2011, the latest image is 2011.08.19, dated 19 August 2011. 0.1 Homer 2002-03-11 First release built from scratch. 0.5 Nova 2003-07-21 Support for PAM, LVM, GRUB. 0.6 Widget 2004-03-01 Support for JFS and XFS added. 2008.06 Overlord 2008-06-24 Availability of USB disk images. 2009.02 2009.02 2009-02-16 Inclusion of AIF (Arch Linux Installation Framework). 2009.08 2009.08 2009-08-10 Pacman 3.3, Usage of new AIF installer, better boot device detection, better date/time setting, re-factored grub installation routines. 2010.05 2010.05 2010-05-17 First snapshot with isohybrid support, dual arch images, using isolinux exclusively and pxe support. 2011.08.19 2011.08.19 2011-08-19 Linux 3.0.3-1, syslinux bootloader support, btrfs and nilfs2 experimental filesystem support.